I like this idea. makes the "heritage" remark personal to Hawk rather than cultural. 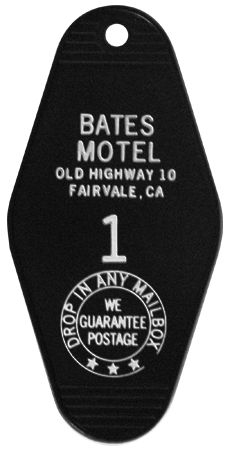 I feel like the room key will certainly lead Cooper back to twin peaks but I wonder how. Logically (which may not help), The key will find it's way to the Great Northern and Audrey or Ben will see it. They will comment on how old it is and that they use a FOB system or something and then they will think about who stayed in that room... I imagine it will be Audrey who remembers and confirms it was Cooper's Key... Maybe that will get back to Bobby Briggs and he'll find it important because Cooper was the last person to see his father alive... They can figure out it came from Vegas then, I guess. I think once the key arrives at the post office it will be put into an envelope with a location origination stamp. I don't think they just float on to the destination per mailman handoff. My guess is it will arrive in TP bagged and bar-coded with Las Vegas i.d. 'd as the point of origin....wondering if the FBI will be alerted if and when Hawk finds it...unless it ends up in a recycling bin at the GN mailroom.......harsh! This is classically funny to a baby boomer who enjoyed the original show in my 30's. Not that long ago, hotel keys were, as represented, physical keys with an attached tag. The tag had the message "Drop into any mail box -Returned postage guaranteed. The address of the motel was on the reverse. In the years since the original series, the technology has changed! Yes, some of us recall those days. I don't know if that'd fly these days as P.O. would have to collect delivery cost when delivering. Try that with a letter or package, it'd be returned to the sender. BTW see part 6 as regards Hawk.